In a display of blatant disregard for Nancy Reagan and her pleas to the contrary, Russia's bears, no longer able to resist the sweet temptation of gasoline, have found themselves suffering from a good, ol' fashioned jet fuel addiction. 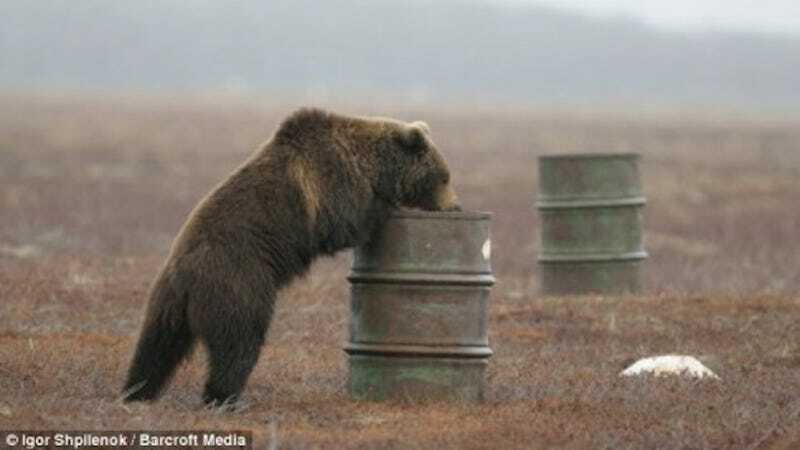 More specifically, it's the bears living on the Kronotsky Nature Reserve that have taken to huffing jet fuel out of old barrels until they're woozy enough to hit the ground. The adorable, 1,200 pound junkies will even go so far as to actively stalk helicopters for their fix, scavenging for and sucking up any excess fuel as it leaks onto the soil. And this isn't our large, furry friend's first foray into the world of vice—Ukranian bears already have a reputation for going a little too heavy on the sauce. While an intervention is clearly in order, it might even help to stop leaving barrels full of discarded jet fuel lying around nature reserves. But we're just tossing out ideas here.